See the best of Germany's Rhine River Valley on a half-day or full-day trip from Frankfurt. 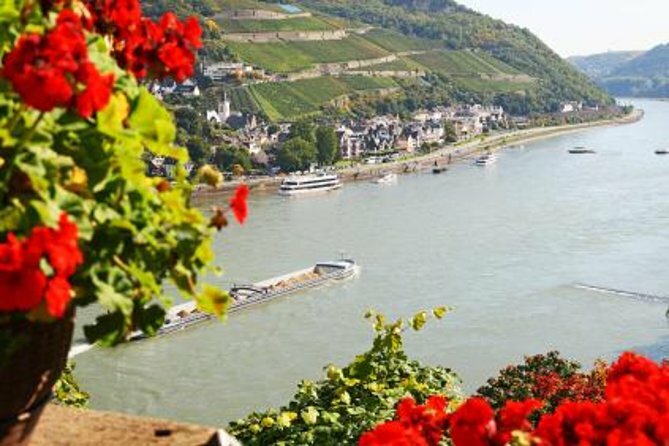 As a time-friendly way to see the Rhine Valley, both trips include a must-do Rhine River cruise and local wine-tasting session amid stunning scenery. Leave the city of Frankfurt behind for an unforgettable day of River Rhine sightseeing! This stretch of the Rhine Valley is listed as a UNESCO World Heritage Site and comprises romantic villages, pretty vineyards and medieval castles that frame the spectacular River Rhine in central Germany. Winding northwards from Switzerland to the North Sea, the River Rhine is stretching an impressive 766 miles (1,232 km). To see it all would require several days, so your Rhine Valley Day Trip focuses on its beautiful UNESCO World Heritage listed stretch. For those with less than a full day to spare, choose the half-day Rhine Valley trip to enjoy a Rhine River cruise (from Kaub to Rudesheim) followed by a wine-tasting session and dinner. This is a great way to experience this unforgettable region in a short space of time. Alternatively, the full-day Rhine Valley trip includes a longer Rhine River Cruise which passes the iconic Loreley Rock. You'll relax over lunch in a gorgeous riverside restaurant and then take a Rhine River cruise to the harbor at St Goarshausen. Here you'll disembark for a wine-tasting session before spending time at leisure in Rudesheim with its many wine bars and shops. You have chosen: Full-Day Rhine Valley Trip, on the date of 26-April-2019, for a price = 93EUR. Number of Adults = 1. And this is the final price, no extra VAT, tax, credit card, etc. charges. After calculating the final price, please read the Terms and Conditions and choose the Add to Cart button at the bottom of this page.